Yours Truly - with her Marinara & cab sav. On Friday, I caught up with a girlfriend to have dinner. We were two Arien girls, on the prowl in High Street, assuming that we would probably end up at a Vietnamese eatery. It sure is, when the universe plants a romantic and sensual little haunt like Che Vita Bella on your path. We ventured in, the lighting throughout gives a magical ambience, a great place for first dates, if you want to impress. We were offered a drink. I wanted a merlot but they were out but a cab sav was suggested and it was a pleasing drop. We sipped at our wines and decided on our order. The garlic bread was promptly chosen for the appetiser. Freshly made Gnocchi was offered as the 'special' with napoli sauce, my friend was satisfied with that as her main. Now I had to choose. The menu had various 'Italian favourites' I should have tried, especially the pasta with a chilli ragu, that apparently - according to the menu will blow your head off. I liked that, it gave me a laugh. I was in a safe mood, which is unusual for me but I felt like devouring something that was familiar. Being a seafood addict, I had to go for the Spaghetti Marinara. I ordered another glass of red while my friend sat on her chardonnay. The food arrived, the presentation was amazing. Apparently my friend's gnocchi was delicious and so very fresh. 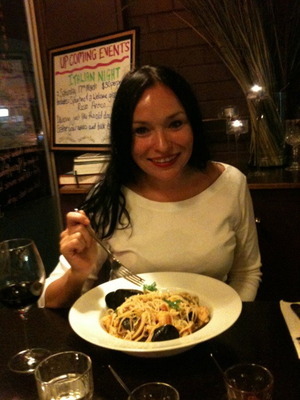 My marinara, was rich with yummy seafoods - calamari, mussels, king prawns, pieces of fish. At the conclusion of our meal we ordered our coffees and I asked if they had any Tiramasu but was told they were out, due to a function. Che Vita Bella is a lovely find, apparently it is open for breakfast and lunch, which I would be interested to try. The damage of the bill was $63, which is very reasonably priced for 1 appetiser, 2 mains, 3 glasses of wine and two coffees. It would have been an extra bonus, if they had the merlot and tirimasu but overall, we were happy customers. If you are out Preston way and looking for Italian cusine, head to Che Vita Bella because life is beautiful and what you eat should be too.